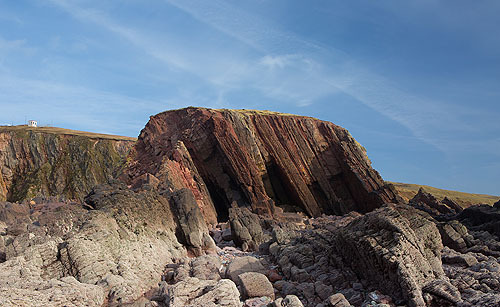 A view over a rough wave cut platform to the eroding 'Old Red Sandstone' Headland of Great Furzenip . Military lookout post just in view. The extensive wave cut platform extends to Freshwater West Beach (to the north) and Frainslake Sands (to the South).